Citizen Watches have the wrong Manning brother endorsing their Echo Drive watch. Eli is not unstoppable, but brother Peyton pretty much is. 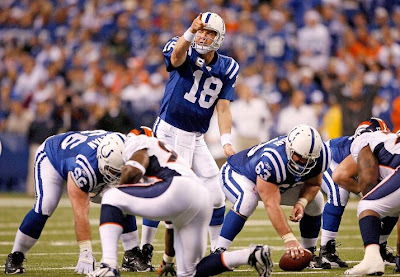 The Colts looked invincible for the first 20 minutes of the game running out to a 21-0 lead and burying the Broncos. 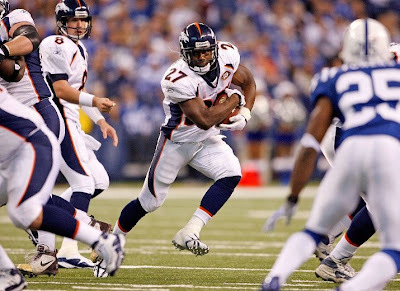 Indianapolis then looked very beatable for most of the rest of the game as the Broncos rallied to bring it to 21-16, but then Peyton Manning had a predictable seven-minute game icing drive in the 4th quarter, and it was over. If you just look at the stats, Peyton actually had a bad game. He completed only 20 of 42 passes for 220 yards and he had three interceptions. However, stats lie all the time. Yes, from midway through the second quarter, to that last drive in the 4th quarter, Manning looked extremely mortal. He threw all three interceptions during that stretch, and was pretty inaccurate and frustrated during that time. However, he had earned a little slack because he had built up a 21 point lead, and then when the Colts needed him, Peyton won the game for them. 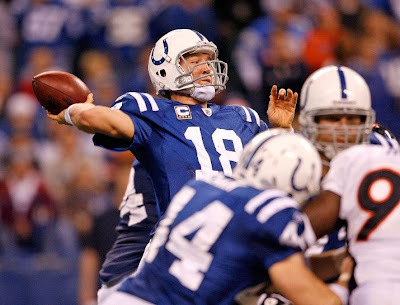 As long as the Colts have Peyton Manning they have a shot. Peyton is such a stud, the facts are that despite having a pedestrian 65.6 passer rating he was the man. He threw four touchdown passes, iced the game in the clutch, pooped in the refrigerator, and ate a whole wheel of cheese. I'm not even mad at him, that was amazing. What a game for Brandon Marshall, 21 catches! Holy Geez! Brandon Marshall: Yeah, if you set a new NFL record for most catches in a game, you get 200 receiving yards, and two touchdowns, I'd say that's a positive day. Unfortunately, the rest of the team was not nearly as on fire as Marshall, or the Broncos would have won by 50. I watched the game at my brother's house, and as I was driving back home I heard some idiot talking about how Marshall still isn't doing enough for this team. What, he needs to start walking on water and healing blind men? How much more can one wide receiver do? Brandon earned his paycheck today, well done, sir! Brian Dawkins: 10 tackles and 2 interceptions off of crazy deflections. 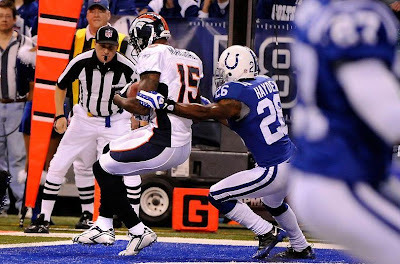 The funniest moment of the day was the second Dawkins interception that came when a Peyton Manning pass bounced off of Champ Bailey's face. 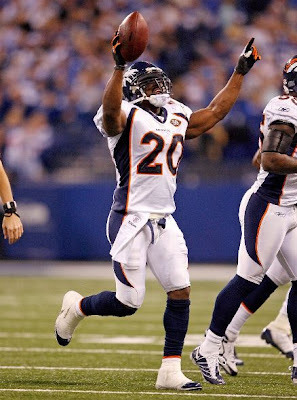 It was funny and a good play for the Broncos, so it was a great combo for me! Good day for the man who they call Wolverine. There is just something likable about Kyle Orton, resplendent in all his mediocrity. I dig him. 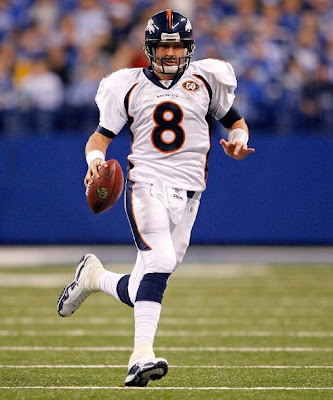 Kyle Orton: Kyle had a solid day, he was stepping up in the pocket, not panicking, finding recievers...well, finding Brandon Marshall, and apart from one bad toss that was intercepted, generally did a good job playing the type of ball that the Broncos need from him. He isn't a great quarterback, but he was good today, and when Orton is good, the Broncos have a chance. The 1st Quarter: Nothing went well for the Broncos in the first 15 minutes. Manning put on a clinic on how to pick apart a defense. The Broncos were down 14-0 when the Broncos took their fourth snap. It looked like the Colts were on their way to winning by 70 based on the first quarter decimation. The Colts offense was too much for the Broncos. The Run Defense: Joe Addai and Mike Hart weren't spectacular, but they kept getting important yards, and the Broncos just couldn't get the run game stopped all game. It became critical later on in the game, as the clock just kept running and the Colts had a good offensive balance which helped Manning. Not Knowshon's greatest performance today. Knowshon Moreno: Averaging 2.7 yards per carry is not getting it done, not even close. Knowshon had to carry a bigger load that usual, as Correll Buckhalter sprained his ankle in the first quarter. Knowhon showed that he is not ready to carry the load by himself. He didn't fumble, but he looked over-matched today and not one time did he look special. Short yardage situations: The Broncos went for it on 4th down on three different occasions, and failed each time. Toss in a handful of failed 3rd and short situations where a first down keeps hope alive, and the fact becomes obvious that the Broncos cannot pick up one yard when they really need to. It didn't help that Josh McDaniels kept hammering Knowshon up the middle even though there was nothing happening on those plays. The Broncos need to figure out a way to convert these plays if they want to 1. Make the playoffs and 2. Do something once they get there. 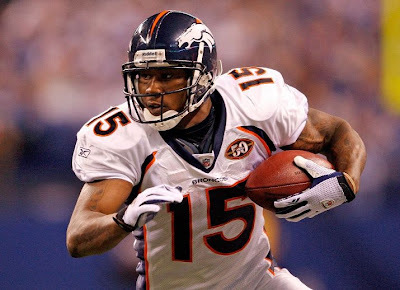 Even if he's often a bonehead, Brandon Marshall is easily the most exciting player on the Broncos. I can't help but cheer for the guy. He's like Doritos, I like him even though I know he's not good for me. The Colts are going to finish undefeated unless they stop themselves by not trying over the final three games. The Broncos are a good team that may play a playoff game, but this game showed that they have a way to go if they want to be elite. I wasn't expecting to get a win in Indy, so the fact that they loss is far from surprising and I'm not overly disappointed. The two games they must get are the final two home games against Kansas City and Oakland. As long as they get those two...they should make the playoffs. The game in Philly would just be icing at this point. Beating the Colts is going to require a perfect game, and the Broncos were far from perfect today, but they can take hope that the Colts are beatable. They say that there is no such thing as a moral victory in the NFL, but they are wrong. This was a moral victory for the Broncos.